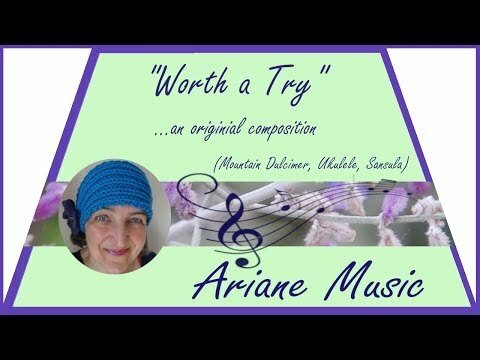 Some days ago this melody emerged from playing a little bit around on my dulcimer and I thought that it is "Worth a Try" to make a whole composition out of it. very nice you are a talented lady. Thank you very much, Ken - I am happy that you like it. Very nice, Ariane. You did a wonderful job. It was not only Worth a Try, but also worth watching and listening. Thank you very much, Marc, for your kind comment. I have never heard of a Stoessel Lute - looks "uncommon" with this very short fretboard. Did you buy it and if so how do you like it? Hi Ariane, what a wonderful composition! Beautifully arranged & performed with all those instruments. My brother & I spent some time in Hattingen, Germany last October and came across an old Stoessel Lute in a music shop. Seems it was quite common in the early 1900's but later lost popularity. Are you familiar with this instrument ? Thank you very much, Gordon, for your kind comment - I am happy that you like it. Thank you very much for your kind comment, Kjb - I am very happy that you like it. I am looking forward to your recordings. I really enjoyed this, especially since I play ukulele. I’m new to the mountain dulcimer and have been thinking of recording tunes with uke, mandolin and md. Thank you very much, Steven, Kevin and Dusty, for your very kind comments. I am very happy to read them. Thank you for sharing this Ariane. It is indeed a lovely melody. That's a really compelling melody you've come up with, Ariane. Nice job! Very beautiful, Ariane. You always do such a great job. I love your music. Nice tune with a good mix of instruments, Ariane!